Marco Rubio was right in a way, and not only right-wing. He was correct, in a minor, insignificant, manner and not as he meant to be During the recent GOP presidential debate, the Florida senator contended Hillary Clinton's testimony before the Benghazi committee became "the week she got exposed as a liar. It was the week that she got exposed as a liar -- but she has her super PAC helping her out, the American mainstream media." The mainstream media, focused on the horse race and each candidate's won-loss record, did imply that the GOP members, far more concerned themselves with scoring political points than with embassy security, barely laid a glove on the former Secretary of State. Nonetheless, that was the perspective also of a nice chunk of the conservative media. We have libertarian conservative Matt Lewis live tweeting "Unless something happens, it's starting to look like Hillary Clinton won't merely survive this hearing -- she will have come out on top." Brendan Michael Dougherty, formerly an editor at The American Conservative, wrote "Hillary = Lucy GOP = Charlie Brown Except the football is a grenade and Charlie Brown wrestles until he grabs it, unpins, and swallows it." Suggesting the long-term political consequences, John Podhoretz tweeted "Why doesn't Pompeo just go over and swear her in for president now--if he goes on like this he'll practically get her elected." This echoed the very mainstream Jonathan Allen of Vox, who wrote "it was a defining moment for Clinton's presidential aspirations. She handled the GOP’s questions with aplomb and without the patina of partisanship that has characterized the committee since its conception." As, fittingly, Mrs. Clinton's husband learned to his delight when Ken Starr went after him, there is nothing which will more effectively secure the Democratic base than to have overtly partisan Republicans try to destroy you. Trey Gowdy & Company might as well have been on the candidate's payroll. Nevertheless, coming out of the presidential debate there is no politician anywhere with less of a right than Senator Rubio to denounce the "mainstream media" for running interference for a politician. Notwithstanding later polls which showed Ben Carson and Donald Trump still leading the pack, the verdict was Rubio by at least a TKO. The Rubio victory had nothing to do with the merit of his response to arguably the most substantive issue posed all night, when CNBC's John Harwood pointed out that the Tax Foundation "scored your tax plan and concluded that you give nearly twice as much of a gain in after-tax income to the top 1 percent as to people in the middle of the income scale." 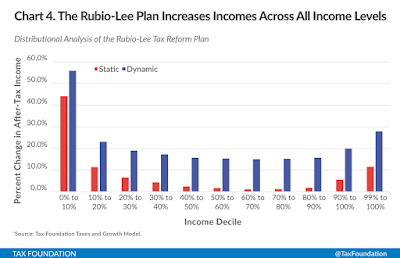 Rubio conceded "numerically, it’s gonna be higher" while arguing "the greatest gains, percentage-wise, for people, are gonna be at the lower end of our plan..." He stated also "Yeah, but that — because the math is, if you — 5 percent of a million is a lot more than 5 percent of a thousand. 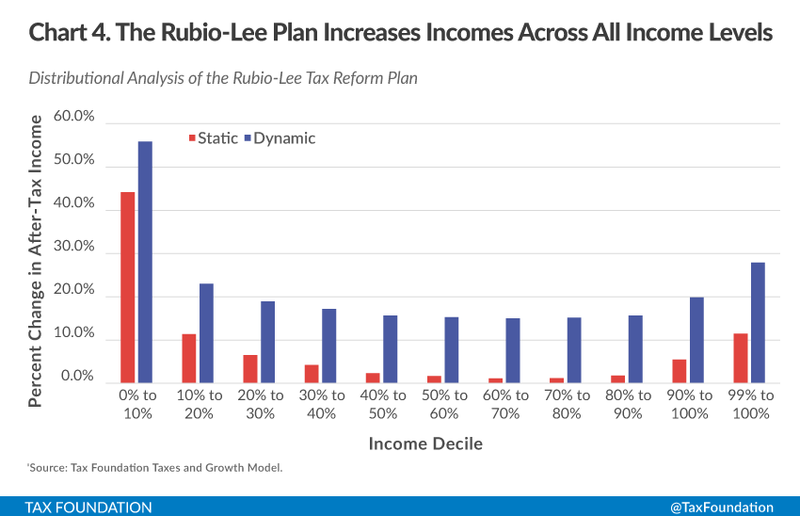 So yeah, someone who makes more money…"
Rubio further confused the issue with his explanation that “5 percent of a million is a lot more than 5 percent of a thousand.” As we noted earlier, it’s not just that those in the top 1 percent of tax filers would be seeing greater dollar savings in Rubio’s plan than those in the middle income brackets, it’s that those at the top would see a greater percentage gain as well. Emphasizing style over substance, the mainstream media gave both Clinton and Rubio an "A" for their performances. 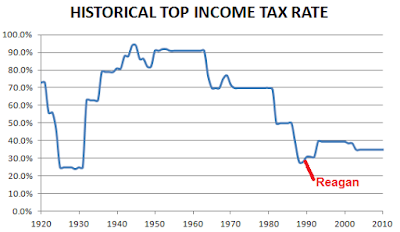 Clinton displayed more substance, though Rubio effectively tossed aside Hargrove's question by denying that his plan, better for low-income than middle-income taxpayers, is best for the wealthiest (graph below from the Tax Foundation via Media Matters), If Mrs. Clinton runs an ad next fall slamming Marco Rubio for targeting the middle clas, he'll need to do some fast talking. We all should have seen it coming, though I did not. New Hampshire voters seem to believe that of those of you on the stage, you are the most experienced and the most electable. In terms of change, they see Senators Obama and Edwards as the agents of change, in New Hampshire mindset. My question to you is simply this: What can you say to the voters of New Hampshire on this stage tonight, who see a resume and like it but are hesitating on the likability issue, where they seem to like Barack Obama more. Playing on the stereotype of the weak, yet sensitive, woman of fragile emotions, Mrs. Clinton responded "well, that hurts my feelings" After the moderator said he was "sorry," the candidate, accompanied by sympathetic laughter, continued"but I'll try to go on. He's very likeable. I agree with that. I don't think I'm that bad." Inclined to impart the arguable- but legitimate- message (in his classic passive-agressive manner) that Clinton was simply the inferior candidate, Senator Obama agreed with Clinton by stating "You're likable enough, Hillary." As the summary accompanying the video below reads, "The backhanded compliment may have drawn nervous laughter in the auditorium, but it prompted a major backlash in the days to come. Clinton supporters painted Obama as cruel and insensitive, and voters handed him a stunning defeat in New Hampshire just a few days later." I cast my primary vote months later for Mrs. Clinton over Barack Obama, whom I've always considered patronizing. Ironically, though, that was not the case with the remark "you're likable enough, Hillary." Given the context of the remark, including the question and Clinton's initial response, Obama's remark was neither patronizing nor sexist. But it appears portraying it as such may have been the deciding factor in the New Yorker's surprising come-from-behind victory in the Granite State. Quinn, who ran for New York City mayor in 2013, said a recent Bloomberg Politics story that quoted Sanders campaign manager Jeff Weaver joking that “we’re willing to consider her for vice president...we’ll even interview her” was beyond the pale. Sanders’ predicament has its roots in the first Democratic debate earlier this month, when the Vermont senator said “all the shouting in the world” won’t fix the country’s systemic problem with gun violence -- a comment Clinton and her allies have since interpreted as an implicitly sexist filleting of the former secretary of state. Sanders insists that wasn’t his intention. But the fight has since escalated, with his top campaign brass (notably, male) blasting Clinton for implying that Sanders’ comment was sexist, and then joking they would consider granting the frontrunner an interview for a vice presidential slot on their ticket. Scott Walker has yet to launch his presidential campaign, but the Wisconsin governor is already talking both privately and publicly about a running mate: Marco Rubio. This comes as news to Rubio, the freshman Florida senator who is running his own campaign to be president. The constant prodding from Walker has become an irritant between the two GOP rivals, neither of whom knows the other all that well. The goal for Walker is clear: to calm the nerves of Republican power brokers who love his conservative message and anti-union pedigree but who worry about the appeal of a white male Midwestern governor in a fast-changing country — especially if Hillary Rodham Clinton is the Democratic nominee. He added that “quite a few people” have suggested a Walker-Rubio ticket to him. 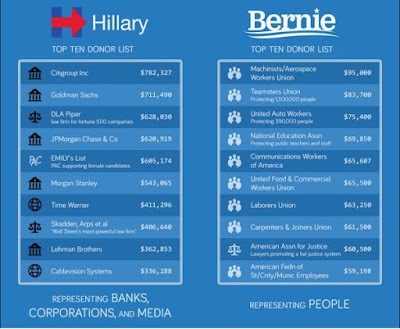 Some Clinton allies pointed to the top ranks of Sanders’ campaign as the root of what they see as an insensitivity problem: Sanders’ campaign manager, communications director, field director, early state organizer, Iowa campaign coordinator and top strategists are all men (an aide to the Vermont senator noted that the team’s New Hampshire state director is a woman and Sanders’ chief of staff in the Senate, Michaeleen Crowell, who helps with some campaign duties like debate prep, is also a woman). “Having diverse perspectives in your campaign leadership results in better strategy, just like having diverse voices at decision making tables results in better policies," said a Clinton ally who declined to criticize Sanders’ team on the record. Presumably, their candidate values having diverse perspectives. Once a supporter of the 1994 Omnibus Crime Control Act, Mrs. Clinton now condemns "mass incarceration." Ardent advocate of free trade, she since (belatedly) has come out against the Trans-Pacific Partnership. Having voted for the Iraq War resolution, she since has apologized for the measure which gave President Bush a greaer opportunity to invade Iraq. On each issue, Mrs. Clinton herself represents "diverse perspectives." And abortion. As recently as the 2008 Democratic primary campaign- while vying for votes of Democrats, most of them liberal/progressive- Senator Clinton reiterated her view that abortion should be “safe, legal and rare, and by rare I mean rare” (at approximately 1:10 in video below). limit the provision of care only to physicians; force practices to convert needlessly into mini-hospitals at great expense; require abortion providers to get admitting privileges; and require facilities to have a transfer agreement with a local hospital (with nothing requiring hospitals to grant such privileges).Further, in many states abortion care is limited to hospitals or other specialized facilities, rather than physicians' offices. “If you look at my record in the Congress,” explains Bernie Sanders, “you will find there are very few people who have a stronger pro-woman voting record, including a 100 percent record as an abortion rights advocate.” Alas, to some of Hillary Clinton's supporters, issues and record are far less important than appearances, wherein perceived slights can be strategically elevated to spurious charges of gender insensitivity. You bet they do. And if I were the prosecutor, that is exactly where they would be. The fact is that this Justice Department under this president has been a political Justice Department. It has been a Justice Department that decided that they want to pick who the winners and losers are. They like General Motors, so they give them a pass. They don’t like somebody else like David Petraeus, they prosecute them and send a decorated general on to disgrace. It’s a political Justice Department. that he gave highly-classified journals to his onetime lover and that he lied to the FBI about it. But he only has to plead guilty to a single misdemeanor that will not involve a jail sentence thanks to a deal with federal prosecutors. The deal is yet another example of a senior official treated leniently for the sorts of violations that lower-level officials are punished severely for. That is Chris Christie's proof that the Administration "picks winners and losers." He's fine with the numerous whistleblowers prosecuted by the Obama Attorney General's office, more than all other presidents combined. Five of these have gone to prison and Edward Snowden is likely to be sent there if he ever returns from exile in Russia, where he enjoys a modicum of freedom, to the Land of Exceptionalism. The Obama Administration so viciously pursued David Petraeus that he was sentenced to probation (though with a $100,000 fine, as noted in the video below) and became an adviser to the White House. That's quite "a political Justice Department." Christie might have mentioned the same Justice Department has sent to jail zero (0) bankers for their role in the mortgage fraud which brought down the economy. He might have but didn't, because it was Chris Christie, and it was the Republican Party. And have I mentioned how loathsome Carly Fiorina is? A week went by. Clinton prepared for her Oct. 22 testimony before the House Select Committee on Benghazi. When she returned to the campaign trail on Oct. 23, in aspeech to the Democratic National Committee Women’s Leadership Forum, her account of the exchange with Sanders was no longer just about guns. It was about sexism. “You know,” she began—clearing her throat to signal the sound bite ahead—“I’ve been told to stop, and I quote, ‘shouting’ about gun violence. Well, first of all, I’m not shouting. It’s just [that] when women talk, some people think we’re shouting.” The audience hooted, screamed, and cheered. Clinton grinned. “I will not be silenced, because we will not be silenced,” she declared. Without naming Sanders, Clinton is "using the story to bond with women, to paint Sanders as a patronizing old fart, and to portray herself as a victim." would ask the people who are getting all bent out of shape over this to put yourself in the shoes of the many women who found the exchange between Sanders and Clinton to be annoying. When a man is condescending to you, it’s often hard to tell if that’s just how he is to everyone or if it’s just women he talks down to. It gets even more complicated when you realize that a lot of men who are condescending toeveryone still turn the volume up even more when they’re talking to women. And that is exactly how the “shouting” exchange felt during the debate. Yes, Sanders used the same general talking point in response to both Clinton and O’Malley. But he was more aggressive about it with Clinton, saying, “All the shouting in the world is not going to do what I would hope all of us want,” whereas he merely told O’Malley, “Here is the point, governor. We can raise our voices.” His tone and the amount of force he put behind this openly condescending talking point was very different. Telling women they’re just imagining things reads, in and of itself, like it’s sexist condescension. (APPLAUSE) ... supports background checks, and even the majority of gun owners do. Senator Sanders did vote five times against the Brady bill. Since it was passed, more than 2 million prohibited purchases have been prevented. He also did vote, as he said, for this immunity provision. I voted against it. I was in the Senate at the same time. It wasn’t that complicated to me. It was pretty straightforward to me that he was going to give immunity to the only industry in America. Everybody else has to be accountable, but not the gun manufacturers. And we need to stand up and say: Enough of that. We’re not going to let it continue. SANDERS: As a senator from a rural state, what I can tell Secretary Clinton, that all the shouting in the world is not going to do what I would hope all of us want, and that is keep guns out of the hands of people who should not have those guns and end this horrible violence that we are seeing. 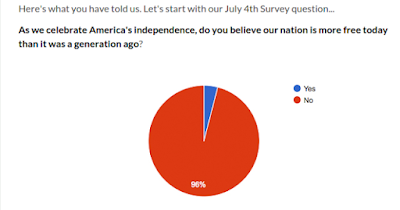 I believe that there is a consensus in this country. A consensus has said we need to strengthen and expand instant background checks, do away with this gun show loophole, that we have to address the issue of mental health, that we have to deal with the strawman purchasing issue, and that when we develop that consensus, we can finally, finally do something to address this issue. Yes, Sanders used the same general talking point in response to both Clinton and O’Malley. But he was more aggressive about it with Clinton, saying, “All the shouting in the world is not going to do what I would hope all of us want,” whereas he merely told O’Malley, “Here is the point, governor. We can raise our voices.” His tone and the amount of force he put behind this openly condescending talking point was very different. Telling women they’re just imagining things reads, in and of itself, like it’s sexist condescension. Alert Hillary Clinton. for as Saletan observes, had the former Secretary of State perceived Sanders' "rebuke as sexist"
you’d expect her to have said so in her first accounts of the exchange. She didn’t. She waited more than a week before embellishing the story. She prepared it as a sound bite for social media, and she unveiled it at a women’s forum. And it worked, so she’s still using it. The impact of rural vs. urban lifestyle as explanation for contrasting approaches to gun control is otherwise largely ignored. Instead, "gun rights" advocates want few if any restrictions on the ability of anyone to possess firearms no matter where they live. Neither they nor gun safety proponents are willing to acknowledge that firearms represent something far different in northern Maine, Michigan's upper Peninsula, southern Idaho, western Virginia, or west Texas than they do in Philadelphia, Cleveland, St. Louis, Denver, or even Houston. So, too, was the Vermont senator speaking of differing perspectives when he referred to "all the shouting in the world" or when he told O'Malley "We can raise our voices, but I come from a rural state, and the views on gun control in rural states are different than in urban states, whether we like it or not." Sanders' observation in the debate about "all the shouting in the world" and in July about "yelling and screaming at each other about guns" for decades was description, not prescription, and less opinion than observation, for he recognizes the obstacles to sensible gun regulation. "Shouting in the world" is little different than "we can raise our voices, but" to a debater inclined to vary his syntax. In a classic case of forcing someone to prove the negative, we cannot disprove Marcotte's contention that "Clinton’s talking point is also landing because it plays off not-unreasonable fears that a lot of women have that at least some of the Sanders support base is coming from condescending, know-it-all men who have unconscious issues with women in authority." But there is no hard evidence that "Sander's support base is coming from" such "know-it-all men." Clinton does not directly argue that, and Marcotte merely counts it as a legitimate fear, without providing substantiation. "When women talk, some people think we're shouting," emphasizes the candidate hardly reticent about emphasizing the gender divide. Yet, without suggesting that Mrs. Clinton values women more than men or that her supporters are "man-hating females," Sanders, focusing on economic issues, is smeared as harboring some unconscious prejudice toward women. 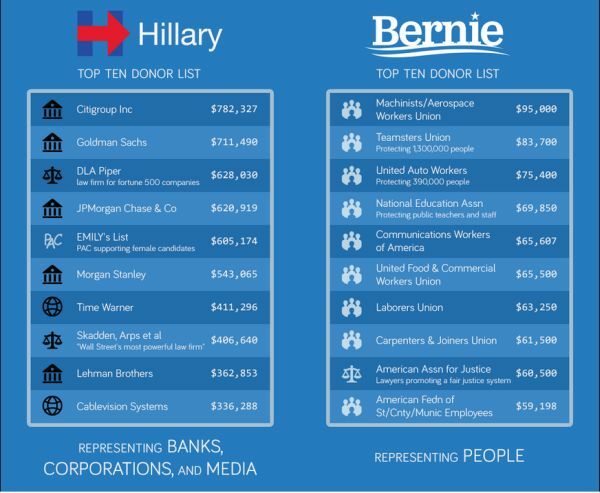 There is something wrong here, and it's not with Bernie Sanders or his supporters. The GOP's circus to come up with a Speaker of the House reveals all we need to know about Paul Ryan- and about the last (nearly) seven years. this whole incident is a reminder that what is wrong with Ryan’s libertarian-inflected conservatism goes far deeper than mere hypocrisy. In fact, I’d argue that Ryan isn’t really a hypocrite at all, but that this move to preserve his family time is a perfect distillation of the Ayn Rand-constructed worldview he has, where all the goodies are reserved for the elite and the rest of us can go hang. And by “goodies,” I don’t just mean NFL tickets and first class plane tickets every weekend. Increasingly, the Republican worldview is one where even basic things like love, connection, and other basic human needs are being reclassified as privileges that should only be available to the wealthy. he hadn't seen the new bipartisan budget deal and that the secretive process used to craft it "stinks," but there's stuff in the bill that should smell good and familiar to him. One of its most important provisions makes changes to the Social Security Disability Insurance program, and some of those changes came from the House Ways and Means Committee, which oversees Social Security and which Ryan chairs. "Paul Ryan's staff was involved in crafting the provision for weeks," a Democratic aide told HuffPost. "His staff signed off on the provision, his staff also signed off on other key provisions" related to tax compliance and Medicare. Notwithstanding his dogwhistle to the House members who seem as radical as he himself is, Ryan will vote for the measure because he doesn't need his life to be complicated. But he will complain about it. And if you're looking to market land as "beachfront property in Arizona," give a call to Freedom Caucus member Raul Labrador, who thinks Ryan "shares the frustration that we do and he wants to do better and be different. I think we have to take him at his word and he is being sincere." I need your assurance that you will not use the Speaker’s position to advance your immigration policies . . . because there is a huge gap between your immigration position and the wishes of the American citizens I represent,” Brooks wrote. “Your words yesterday constitute the needed assurance. “If my portrayal of your words errs in any respect, please deliver to me . . . a written communication correcting my errorrs. Brooks delivered it directly to Ryan on the House floor and says Ryan called his office during a staff meeting less than two hours later, confirming the accuracy of his promises as stated in the letter. When reached for comment, Ryan confirms Brooks’ account. “I have long and publicly been opposed to the gang of eight bill, and there will be no comprehensive immigration reform under this president,” he tells National Review. "Under this President," the aptly-initialed P.R. (now PDR) maintains. After Barack Obama (A.O. ), all bets are off because Obama won't be around to be given credit. The benefits can go to President Rubio or whomever the Party nominates. Meanwhile, Obama gets no cooperation because it's not about policy, it's about Barack Obama, which is the full story of the last 105 months, full stop. In retrospect, it wasn't surprising former Virginia senator Jim Webb dropped out of the Democratic race for President one week after after he uttered the frightening phrase "all lives matter" at a debate. Webb, as he pointed out, has worked for years on criminal justice reform which was, we were led to believe, at the heart of the "Black Lives Matter" movement. Sometimes and unfortunately, however, slogans take on a life of their own and thereby overshadow more important words and actions. This isn't the rhetoric and position only of the anti-establishment right. Once misperceived as sane and sober, Chris Christie, appearing on CBS' Face the Nation, claimed President Obama "does not support the police, doesn't back up the police, he justifies Black Lives Matter." Asked whether Black Lives Matter should be justified, Christie responded "I don't believe that the movement should be justified when they're calling for the murder of police officers, no." Republican politicians should not alone be called out. Two days earlier, towering FBI director James Comey had contended (video below) "In today's YouTube world, are officers reluctant to get out of their cars and do the work that controls violent crime? Are officers answering 911 calls but avoiding the informal contact that keeps bad guys from standing around, especially with guns?" I actually see an example and demonstration of that arcing through hashtags: the hashtag Black Lives Matter and the hashtag Police Lives Matter. Of course, each of those hashtags and what they represent adds a voice to an important conversation, but each time someone interprets hashtag Black Lives Matter as anti-law enforcement, one line moves away and each time someone interprets hashtag Police Lives Matter as anti-black, the other line moves away. Good save. But whatever that means, it doesn't mean that Comey doesn't still believe police officers turn their backs on the public because of Black Lives Matter. While pledges differ from jurisdiction to jurisdiction, that in Hollywood, Alabama (Hollywood, Alabama?) is not atypical. Upon appointment a police officer solemnly swear(s)" she will not "be influenced in the discharge of my duty by fear"and that "I will, to the best of my skill and ability, faithfully discharge all duties required of me and execute the orders of my superior officers and in all cases uphold and enforce the criminal laws and constitution of the State of Alabama, the ordinances of my jurisdiction, and the criminal laws and Constitution of the United States." James Comey is the nation's chief law enforcement officer. If police officers are not faithfully discharging their duty, we should know who, where, when, how, and why police officers are violating their oath and/or conducting a slowdown. He owes the country nothing less. And if he does not give us the details nor retracts his statement, he is doing the nation a far greater disservice than a dozen "all lives matter" statements. "That might be the greatest answer all week," observed Joe Scarborough (video below) a week or so ago on Morning Joe. The ex- GOP congressman was responding to Lindsey Graham's reply to Eugene Robinson's question about Ben Carson: "How do you explain his obvious appeal?" The South Carolina senator answered "I don't think he has a clue about what's going on in the Mideast. So I don't know. I'm doing the best I can." Good answer, and darned humorous. Again on Morning Joe, on Monday morning Graham was asked (video below) about the same candidate "Have you ever stabbed anyone? Or tried to?" 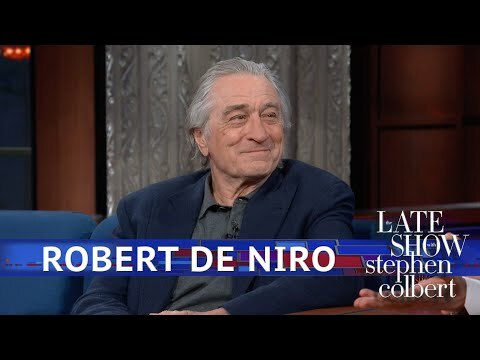 So he ridiculed Bernie Sanders and Hillary Clinton, then quipped "On our side you got the number two guy (who) tried to kill somebody at 14 and the number one guy is high energy and crazy as hell. How am I losing to these people?" As stand-up this is great stuff, and says a lot about the "deep Republican bench" we kept hearing about until these players became candidates and it became clear what they really were made of. Nonetheless, Graham answered his own question, "how am I losing to these people?" He's losing in part because they are "crazy as hell" or, rather, remarkably reckless and self-delusional. It is an asset. If we couple “very attractive” and “mostly attractive” responses, here’s how the numbers stacked up. Carson and Trump actually are striking serious blows against this fascist dictatorship. Congress hasn't found a way to repeal Obamacare or crush Planned Parenthood or permanently block the next debt-ceiling increase or make gay marriage illegal again, and that makes GOP base voters furious at all the party's politicians because, dammit, they ought to be able to do something -- but Ben Carson can say "Nazi, Nazi, Nazi" and get away with it, and Donald Trump can say that undocumented immigrants are feral rapists and get away with that, and that, to Republican voters, is a real blow against the liberal-fascist power structure. But it's not limited to abortion/Planned Parenthood. In a 2009 commencement speech he warned graduates “I daresay the vast majority of German people did not believe what Hitler believed. But they didn’t speak up, and you see what the result was. " Last month he suggested those events could come about in the USA because "If you go back and look at the history of the world, tyranny and despotism and how it starts, it has a lot to do with control of thought and control of speech." Probably, individuals are afraid to say what they actually believe because people will think they are stark, raving mad. Judging by the Des Moines Register/Bloomberg Polotics survey and Carson's ascent to the top of the heap of dung in Iowa, they are not crazy but today's Republicans. Not impressed. No doubt Chaput has talked about immigration reform, which he might support in principle, but definitely would be a boon to the ranks of membership in the Roman Catholic church. The death penalty is such a pivotal issue that less year it directly affected twenty-two (22) individuals in this nation of 319 million people. 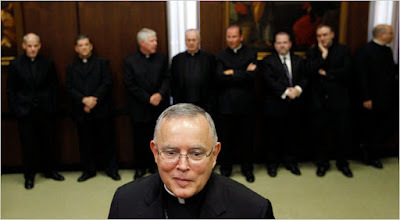 The real story is that Chaput and Francis have much in common. That they’re allies, and that they’re both working, in partnership with laity, for Christian renewal. The real story is that Francis is committed to the Church’s moral teaching, and that Chaput is committed to the Church’s social outreach. gave an interview to the French Catholic magazine Famille Chretienne, reprinted at CatholicPhilly.com, lamenting tiny, two-children families. "I’ve been surprised by how little the synod text says about the joys of having children, and especially the beauty and heroic witness of large families. Children are the future. They’re a gift from God. They renew the world," Chaput told the magazine. "It’s sad to see so many couples today cheat themselves out of more love and more joy by having only two children. Life is meant to be an adventure, to be abundant – not to be strangled by worry. God provides. He never abandons hearts that are generous. I have tremendous esteem for large families. I wish we had many more of them. They’re the hope of the Church." Having been alerted to this revolting statement by reader GDR, I had to check the web to confirm that Philly magazine has not been turned into an East Coast version of The Onion. Confirmation came in the form of various articles of local interest, sports and otherwise, with nary a piece revealing that Barack Obama has admitted he was born on planet Krypton, where he introduced George Reeves to Islam. Then the LORD God said to the woman, "What is this you have done?" The woman said, "The serpent deceived me, and I ate." So the LORD God said to the serpent, "Because you have done this, "Cursed are you above all the livestock and all the wild animals! You will crawl on your belly and you will eat dust all the days of your life. And I will put enmity between you and the woman, and between your offspring and hers; he will crush your head, and you will strike his heel." To the woman he said, "I will greatly increase your pains in childbearing; with pain you will give birth to children.Your desire will be for your husband, and he will rule over you." It might be wishful thinking to believe that Chaput would be disturbed to learn the reasons- and they are many, complex, and largely of secular origin- that life is often strangled by worry, marked by randomness and even brutality. By one reckoning, worldwide there are 750 million people with inadequate access to clean drinking water, 805 million with insufficient food, and 1.6 billion without electricity. And the children, of whom the Archbishop wishes there were far more and for whom "God provides": two million children a year die because they are too poor to afford the treatment for preventable diseasea while 165 million children under the age of 5 in 2011, it is estimated, "were stunted (reduced rate of growth and development) due to chronic malnutrition." Whatever God's role or lack thereof, there is a tremendous number of children not provided for in the developing world, and even a few here, as most other clerics understand. Notwithstanding the roughly 800 women globally who in an average day die from causes related to pregnancy, childbirth, or the postpartum period, tens of millions of women each year decide to get pregnant to have a child. Good for them or as Chaput would say, "God bless them." It's their choice, as it ought to be, and as it ought to be not to become pregnant. Chaput is not for choice (not by a longshot) but he is not insensitive. He is, evidently,concerned about the 20-25 murderers executed each year in the United States. Biden’s words weren’t exactly Churchillian in their grandeur or Lincolnian in their eloquence; but the sentiment he expressed — the firm belief that the American people are not as divided as they seem; that some of the most vexing and bitter policy disputes troubling the country are, “at their core,” deceptively simple — is beautiful. I believe we have to end the divisive partisan politics that is ripping this country apart, and I think we can. It’s mean-spirited, it’s petty, and it’s gone on for much too long. I don’t believe, like some do, that’s it naive to talk to Republicans. I don’t think we should look at Republicans as our enemies. They are our opposition, they are not our enemies. And for the sake of the country, we have to work together. As the president said many times, compromise is not a dirty word. ... at their core, every one of these things is about the same thing — it’s about equality, it’s about fairness, it’s about respect. As my dad used to say, it’s about affording every single person dignity. It’s not complicated. Every single one of these issues is about dignity and the ugly forces of hate and division. They won’t let up, but they do not represent the American people. They do not represent the heart of this country. They represent a small fraction of the political elite; and the next president is going to have to take [them] on. Everybody thought Hillary Clinton was unbeatable, right? But we put together a Benghazi special committee. A select committee. What are her numbers today? Her numbers are dropping. Why? Because she’s untrustable. But no one would have known that any of that had happened had we not fought to make that happen. The attack on Planned Parenthood is especially evocative of the GOP's impulse to block and obstruct, given that the birth control services provided by the organization decrease the rate of abortion, a procedure against which Republicans rage. Ms. Richards' substantial salary may have been the only thing about her testimony, or about Planned Parenthood, congressional Republicans actually liked. They've never had a problem with exorbitant CEO salaries. Cummings believes Republicans "should join Democrats to investigate issues that actually need attention, such as the skyrocketing prices of prescription drugs." As he no doubt is aware, there is a fat chance and a slim chance of that occurring, and slim is on its way out of town. So with a rhetorical flourish and mostly good intentions, Joe Biden has declined to seek the top spot on the Democratic ticket. That's good for the Party- and for himself. When Hillary Clinton was asked at the recent debate "which enemy are you most proud of?" she wisely replied "well, in addition to the NRA, the health insurance companies, the drug companies, the Iranians. Probably the Republicans." If Joe Biden had announced he would run, he would have participated, and may have been stumped for an answer. 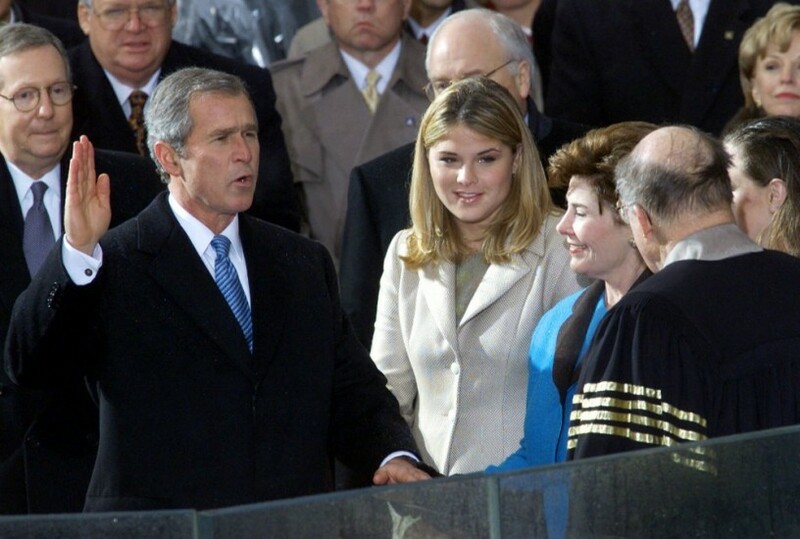 Think Progress' Judd Legum swears George W. Bush was sworn in as President of the United States on January 20, 2001. "Contemporaneous reports," he argues, "suggest that America’s arcane election rules and a favorable Supreme Court ruling handed the election to Bush, even though he lacked popular support." 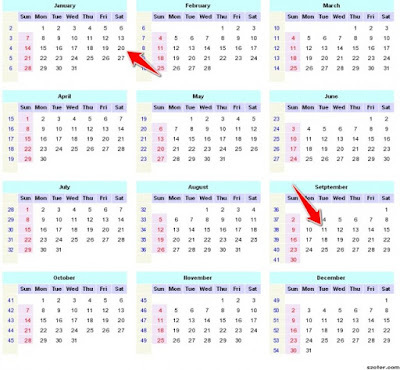 Legum even displays a 2001 calendar (below) which indicates that early September of 2001 came about some 7-8 months after Bush allegedly took the oath of office (photo below) in Washington, D.C. that January. Additionally, he contends, there is evidence that Mr. Bush during that period routinely received the Presidential Daily Brief, which in one case was titled "Bin Laden Determined To Strike in U.S." "Taking into account all the evidence," he contends,"it seems more likely than not that George W. Bush was president on September 11, 2001." It shouldn't be necessary to explain all that. But it is if you're the guy Florida voters were daft enough to have elected their chief executive in November, 1999 and re-elected four years later. At the second presidential debate, following criticism of President George W. Bush by Donald Trump, John Ellis Bush responded "You know what? As it relates to my brother, there is one thing I know for sure, he kept us safe." Last Friday, Donald Trump- without even having read Legum's piece- made the outrageous claim "When you talk about George Bush — I mean, say what you want, the World Trade Center came down during his time. Blame him or don’t blame him, but he was president. The World Trade Center came down during his reign.” He added "I’m not blaming George Bush. But I don’t want Jeb Bush to say, ‘My brother kept us safe,’ because September 11th was one of the worst days in the history of this country." The FBI, the NSA and the CIA weren’t talking to each other. They weren’t talking because they didn’t like each other. They had a lot of problems getting along — and that’s leadership. You know, you have to get your three main agencies to talk to each other. Nero-like, George W. Bush fiddled while Rome burned- or, rather, cut down brush at his ranch while he knew a major terrorist attack was likely to be launched against the nation he had been almost elected to lead. Nonetheless, brother John wrote "In the latest episode of the reality show that is Donald Trump’s campaign, he has blamed my brother for the 9/11 terrorist attacks on our nation. That Trump echoes the attacks of Michael Moore and the fringe Left against my brother is yet another example of his dangerous views on national-security issues." And I think what Jeb means when he says he kept us safe, I think it`s related to the sort of deranged approach that a lot of Americans on all parts of the political spectrum have had to terrorism in the wake of September 11th, which is there came this idea that terrorism is common and is a leading source of mortal threat to Americans. And the fact that we have not had another major terrorist attack since September 11th is therefore a demonstration of extraordinary effort by the government to prevent such attacks. In fact, attacks like this are extremely rare. It was not a normal thing there would be an attack like this and the fact that there was not another attack like that during his presidency or during President Obama`s presidency is not a demonstration that something materially changed in how good we were preventing these things. But a lot of people do think that. They think it was extraordinary that there were no further similar terrorist attacks on American soil. So maybe we should be grateful that John Ellis Bush, ignorant of recent American history, overprotective of big brother, or flat-out lying, went overboard in defending Bush 43. Ultimately, he has a right to read history. He has a right to interpret history or even to erase it from memory. But he has no right to re-write history, even if he is from the House of Bush. It's not hard to imagine him now in a place where his powers have been returned to him and he's himself again -- sweet-hearted, tough, funny, optimistic and very brave. You imagine him snapping one of those little salutes as he turns to say goodbye. Today I imagine saluting right back. Mr. Obama lowered the bar. He did, she no doubt believes, especially as compared to her hero, the 40th President. Of the latter's 1980 campaign pledges, she once adoringly (as always, elegantly) wrote: "Done, done, done, done, done, done, and done. Every bit of it." when GM was our largest employer and our working class were also in the middle class, CEOs only took home 30 times what working people did. 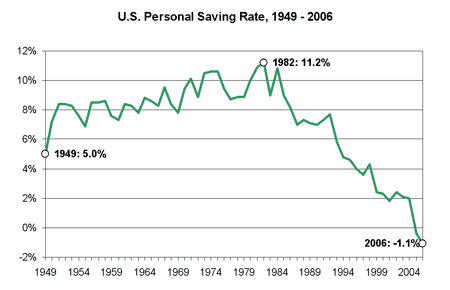 The top tax rate for all the time America’s middle class was created was between 74 and 91 percent. Until, of course, Reagan dropped it to 28 percent and working people moved from the middle class to becoming the working poor. If you compare a chart showing the historical top income tax rate over the course of the twentieth century with a chart of income inequality in the United States over roughly the same time period, you’ll see that the period with the highest taxes on the rich – the period between the Roosevelt and Reagan administrations – was also the period with the lowest levels of economic inequality. Aided by another chart from the Center for American Progress, Hartmann noted that union membership started to decline in 1967 but began to plummet in the first Reagan Administration. Labor was a prominent power in 1981. When the air traffic controllers went out on strike 33 years ago yesterday, on August 3, 1981, the labor movement was still seen as a central force in American government and politics. Both parties, Republican and Democrat, saw labor that way. It was an important moment in American history, though, because Ronald Reagan was in the first months, really, still, of his presidency. He'd been inaugurated in January, 1981. And he was in the middle of rolling out what we call the Reagan revolution. And Reagan wanted to really turn back the clock, you might say, to an approach to American government and politics that was pre-New Deal. 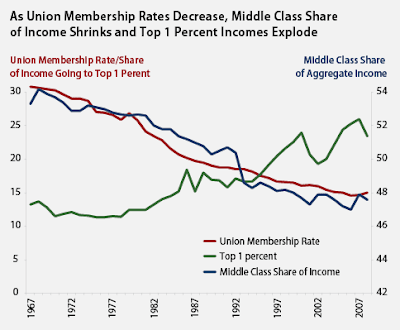 And part of that meant reorganizing the relationship between government and the labor movement. 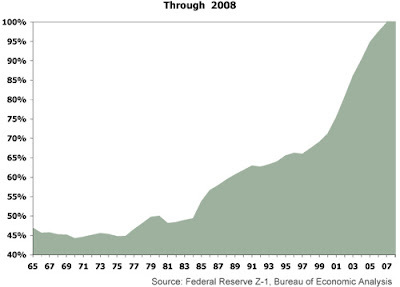 The confluence of the beginning of the Reagan presidency and the downturn of economic indicators is stunning. Dave Johnson displays three graphs (the first from Emmanuel Saez via whitehouse.gov, the third from Federal Reserve Z-1, Bureau of Economic Analysis): the increasing share of total income flowing to the top 10%; the decline in the U.S.A. personal savings rate; the decline in savings of the American people. President Reagan got "tough" with PATCO and declared "They are in violation of the law, and if they do not report to work within 48 hours,they have forfeited their jobs and will be terminated." As the media and the right, including Peggy Noonan, swooned, the legend of the swashbuckling, macho president was born. Organized labor, and the workers it represents, hasn't been the same since. Or as Noonan herself would put it: done, done, done, done, done, done, and done. 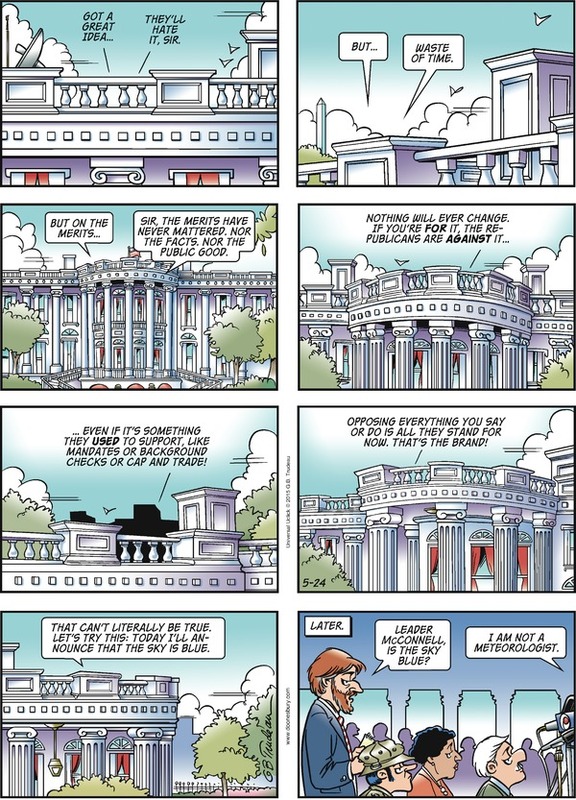 Digby comments "in case you haven't noticed, the Republicans are really eager to get their war on. It's really what they love." The Response Action Network doesn't make it clear whether these questions, among the fourteen (14) posed, were asked only of Republicans. However, there are at least three reasons to question Digby's conclusion, two aside from the realization that only two of the questions posed are related to war. One of those is Lindsey Graham. The South Carolina senator has called for "pulling the caliphate up from the roots" with the deployment of 20,000 USA soldiers to Iraq and Syria. The only candidate sufficiently specific, bold, and reckless to advocate ground forces, Mr. Graham is at less than 1% in GOP presidential preference polls. 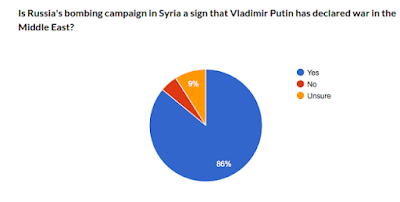 That certainly doesn't prove that the popular base of the Republican Party disagrees with Graham about the Mideast. In fact, remarkably, most Americans- and an overwhelming majority of Republicans- want to send ground soldiers to fight ISIL in Syria and Iraq. But it is very likely that most Republicans are not especially motivated by the issue of Mideast policy or foreign policy generally. The dismaying truth is that birtherism is part of a larger pattern of rejection of reality that has taken hold of intimidating segments of one of the two political parties that alternate in power in our governing institutions. It is akin to the view that global warming is a hoax, or that the budget can be balanced through spending cuts alone,or that contraception causes abortion,or that evolutionis just another theory, on a par with the theory that the earth is six thousand years old. Supply-side economics. Planned Parenthood. Climate change, childhood immunization. It's not only war and peace, and probably not primarily that, but across-the-board a stunning and often willful, ignorance of facts.